Right Angle Gearboxes refer to such types as Worm, Bevel, Helical Bevel, Helical Worm, Planetary, Spiral-Bevel Gearboxes. The difference being how the gear sets are cut as well as combining different styles in different stages of a single gearbox. Bevel gears are designed to change a shaft's rotation. Bevel gears translate one direction of force into another with the power of two axles meeting at an angle of 90 degrees. With the potential to change the direction of force and the operating angle of machinery, a bevel gear has many different applications. Spiral Bevel gearboxes have a Bevel gear with Helical teeth. The main application of this is where the direction of drive from the drive shaft must be turned 90 degrees to drive the wheels. The helical design produces less vibration and noise than conventional straight-cut or spur-cut gear with straight teeth. 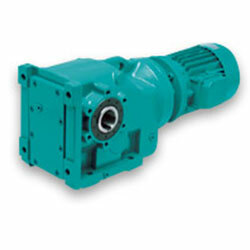 These types of gearboxes are a popular choice when noise and backlash are a concern.